The purpose of this easy-to-use handbook is to provide a quick, accessible reference to nucleobase complexes. It describes these complexes with reference to methods of preparation, their characterization, and their toxicity and therapeutic indices. It lists the modes of coordination together with the relevant spectral data and major methods of investigation. This concise resource guide also includes data on the uncomplexed bases, such as solubility, pk, accepted structures in the solid state and solutions, and the natural occurrence of the base. 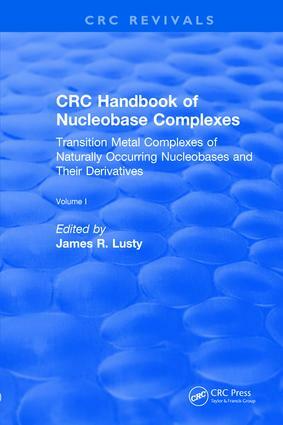 Investigators in the fields of transition metal chemistry, biological inorganic chemistry and those working in medical laboratories will find this handbook indispensable.